Darksiders III developer Gunfire Games is back with another project. Yes, already. 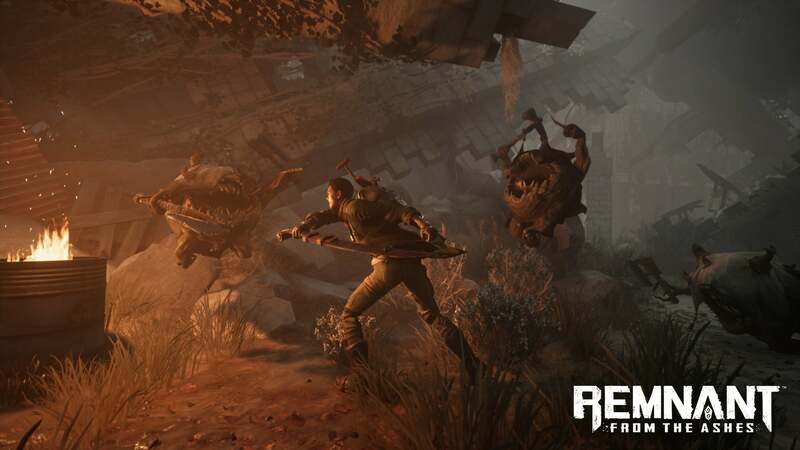 Remnant applies these familiar tropes to a third-person shooter. Gunfire’s not the first to attempt this genre mashup, preempted by last year’s Immortal: Unchained. The idea still seems novel though, and why not? 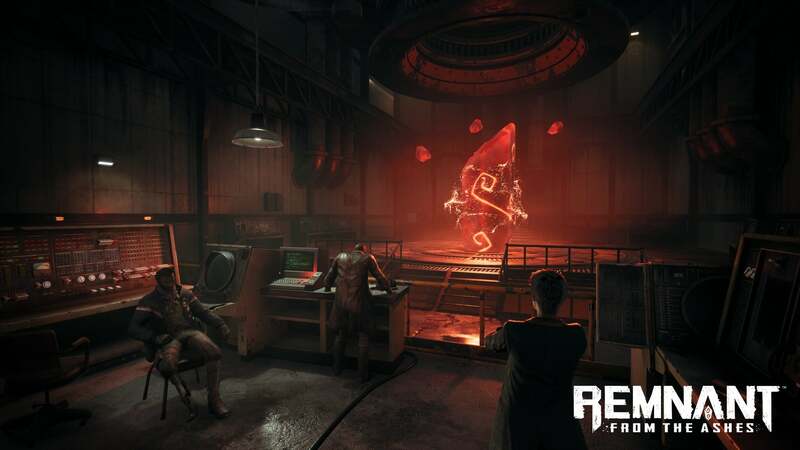 Shooters, even the more “realistic” ones, tend to pride themselves on an immediacy of action that hearkens 25 years back to Wolfenstein 3D and Doom. 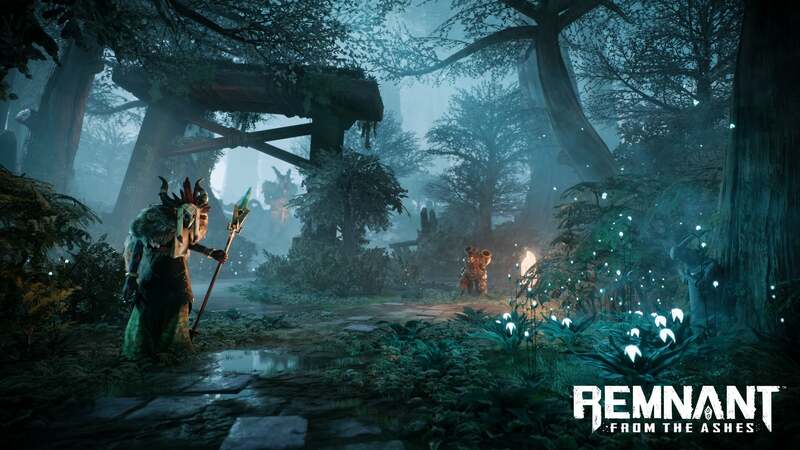 Remnant’s more deliberate pace is an aberration, intentionally wresting some of that power fantasy back from the player. It plays like a shooter, but it’s not tuned like one. Time is the enemy. Pointing a gun is immediate, but aiming a gun? Waiting for the reticle to settle? That takes time. Reloading takes time. Healing takes time. Dodging, then recovering, takes time. And there’s always at least one more enemy than you can comfortably kill before they swarm your position. Better shoot an enemy in the legs and grab some breathing room when it falls over. It’s a unique hybrid. The comparison that keeps coming to mind: It feels like a cover shooter, but sans-cover. The Division 2, Gears of War, these games have deliberate movement and a fragile protagonist as well—but for the purpose of forcing you behind a chest-high wall for some stop-and-pop action. In Remnant there are no walls. It’s all about exploiting the openings you’re given, or creating an opening when none is obvious. Or getting really talented at dodging. “Dark Souls, but a shooter” isn’t quite enough to snag my interest though. It’s important, sure—I suspect Remnant’s reception will largely hinge on the feel of combat, be it circle-strafing to pick off mobs of enemies or plinking away at the damage-resistant bosses. But more interesting is the way Remnant’s stitched together behind-the-scenes. As I said up top, we played through one full dungeon during my demo. Here’s the catch though: The dungeon I played? You’ll never see it. Shortly after sitting down for my demo, David Adams lamented how he finds it impossible to replay games, even ones he loves. And it’s a problem I sympathize with. I recently replayed Riven for instance, and it’s still a masterpiece—but the experience isn’t quite the same when you already know the solution to puzzles that once kept you stumped for days at a time. I think everyone has games they wish they could experience again for the first time, wipe the memories like an old save game and begin fresh. Failing that, the next best solution is to have the computer gin up new levels ad infinitum. This is not a new concept by any means. The Elder Scrolls II: Daggerfall generated quests, characters, loot, and so on—basically everything aside from the main storyline—and did it in 1996. An endlessly replayable game has been the Holy Grail for a long time now. Most games that rely on procedural generation fall prey to the same issue though: Humans are great at pattern recognition. If you ever played No Man’s Sky and thought “This planet is the same as that other planet I saw hours ago, except orange,” then you know what I mean. A deck with five cards can only be dealt so many ways. Adding more assets to the pool is the best way to stave off this problem, but it’s still hard to bypass completely. I don’t expect Remnant to be our Galahad and achieve the Grail, but Gunfire’s ambitious. 100 enemy types and 20 bosses are slated for the game across four different environments, each featuring procedurally generated dungeons, quests, and loot. But if Gunfire has anything going for it, it’s a willingness to show each player only a fraction of the whole. At one point in my demo I stumbled upon a clearing with a shortcut back to where we’d entered the Ruined Earth, Remnant’s post-apocalyptic environment. This shortcut will always be there, but Adams explained to me that while I saw a little tent city full of supplies, other players might encounter a helicopter crash or some other random event. Bosses are similarly varied. As I said, there are 20 world bosses. That only refers to the basic designs though. Each is given a number of random traits as well, so I faced off against a teleporting nightmare of a boss that created exploding gas clouds on my position every few seconds. It took us quite a few tries to take that one down. Another would place staffs into the arena, some of which called in mob enemies and others which hit us with lightning attacks. There are a lot of levers for Gunfire to pull. There are also a few levers for players to pull, and this is the part that I’m most curious to see in action—and the part Gunfire’s most keen for us to avoid spoiling. 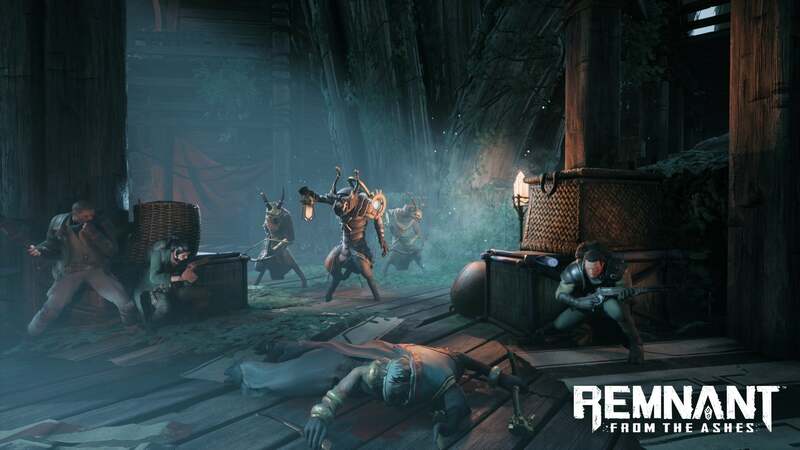 Suffice it to say, there are secrets in Remnant ’s dungeons that have later gameplay ramifications, and discovering how those secrets work is part of Gunfire’s larger vision. I’m most curious whether Remnant can feel designed though. Hand-crafted. Gunfire’s borrowing a lot from Dark Souls but shying away from one vital component: Level design. From Software is meticulous about it, building enormous mazes that feel as much puzzle box as combat arena. Every enemy is precisely placed, and every sightline carefully constructed (or constricted). I said up top that both Darksiders III and Remnant borrow from the Souls series, but this is where they diverge. Darksiders III tried to emulate that bespoke feel, showing you a glimpse of a boss from across a ravine, or teasing a dungeon you couldn’t quite reach yet. It was built that way on purpose. But Remnant? It needs to recreate that feeling via algorithm, and that’s a tall order. There’s a lot of potential here, and a lot of half-explained systems that seem like they could be interesting if everything goes to plan. But will it be enough? I just don’t know. Right now, Remnant feels cohesive, even beautiful at times. In between the larger encounters are a lot of maze-like passageways with little visual splendor though, a cold emptiness I already associate with machine-generated levels. Sure, they’re technically corridors you’ve never seen before—but does it matter, if every corridor looks essentially the same? We’ll see. 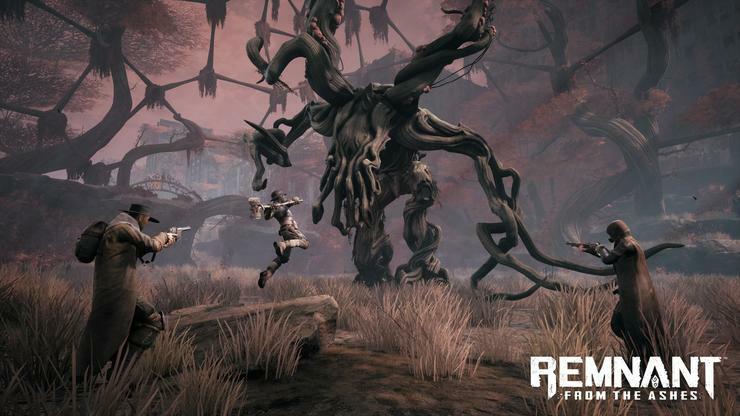 Remnant: From the Ashes is due to release August 20, 2019 for $40.